Imagine your first campout. There’s tons of fun, right? Well, that was exactly what the boys in Troop 45 planned. 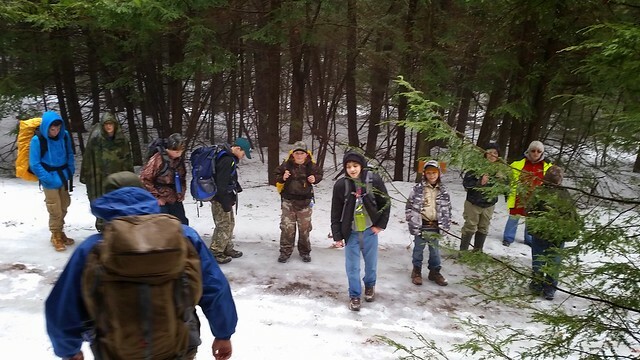 Undeterred by the weather, they planned a two night campout in sub-freezing temperatures. While the heat was enough to make things sloshy during the day, it certainly got cold at night. Through the weekend, the boys built campfires, took hikes, played in the woods, cooked their own meals, conducted flag ceremonies, and generally had a blast. This was the first campout for some of the new scouts that just joined the troop, so it was especially fun. At the end of the weekend, everyone agreed that we need to learn the recipe to Frito Pie, and we need to avoid that canopy! Overall, everyone had a blast and learned a lot. If you missed the campout, you missed a lot of fun.